If forced to pick one word to describe the 2018 Chevrolet Silverado 2500HD, the perfect word would have to be dependable. Not just dependable in power, but in every aspect, you can imagine. You can depend on this full-size pickup to always shine with a strong and modern presence, to always be packed full of extra features and the latest technology, and of course, you can depend on this full-size pickup to get you anywhere with anything. The 2018 Silverado 2500HD is just that well-rounded and dependable. 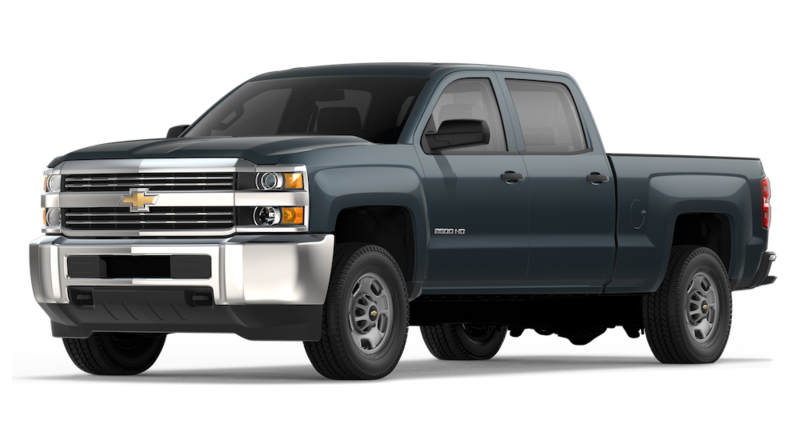 Starting at a reasonable $34,400 the 2018 Chevrolet Silverado 2500HD offers two commanding engine selections and four customizable trim level options that just get more impressive as you upgrade. These choices allow buyers the power to make the Silverado their very own, and nothing makes a vehicle more attractive than you having an optimal say in how it’s made. Those who will show the most enthusiasm for the dependable 2018 Chevrolet Silverado 2500HD do not completely line up with simply those that love heavy-duty trucks. The thing that makes this Silverado model special is that it is a pickup with power that you don’t just drive and haul stuff with, but one that you can completely place all your trust with due to its pure dependability as a soundly engineered full-size truck with a clean style. You will never have to face the world alone as long as you are behind the wheel of the 2018 Silverado 2500HD. This truck is for the enthusiast who desires a loyal friend more than just a dominant tool for work. The Silverado luckily gives drivers both in one stylishly structured pickup. Each trim level of the 2018 Chevrolet Silverado 2500HD has its own list of exciting extras that increase the value of this full-sized pickup. The Work Truck for the 2018 Chevrolet Silverado 2500HD starts at $39,595 and offers the Chevrolet MyLink system connected to your personal 7-inch display. It also comes with safety technology such as a rear-vision camera and Duralife brake rotors. Starting at $44,895 the LT trim comes standard with the most desirable features of the Work Truck trim. As a plus, this level also includes a 4.2-inch Information Center, EZ Lift and Lower tailgate, a touch display sized at 8 inches, 4G connectivity, a 3-month trial of SiriusXM, and OnStar membership to always have backup in a moments notice. For a more cohesive look, you can also now have the handles, caps, and siding of your Silverado match the body-color. For those wanting either double or crew cab, the LTZ takes the Chevrolet Silverado 2500HD LT trim and upgrades like starting the engine remotely, climate control, outlets, luxurious heated seats, defroster for the powered rear window, a package made for trailering equipment, and magnificent chrome to boost exterior value. At $50,965 it is pricey, but the luxury just may be worth it to make a driver feel at home on the road. Lastly, the High Country trim is the top of the line when it comes to extra amenities, and the starting price of $57,095 reflects that. Only in Crew Cab, this trim offers a boost to the display which will also comes with navigation and premium audio systems. The safety is also upgraded with front, and rear park assist. As for the exterior and interior of this trim, the grille becomes massive along with 20 inch chromed aluminum wheels while the inside now upgrades your seats to become lusciously leather-appointed and amazingly heated and vented in more unique colors. The trim you choose is just a reflection of your lifestyle needs. No matter which you choose though, you can be guaranteed impressive power and control. The 2018 Chevrolet Silverado 2500HD offers two optimally efficient V8 engines to keep you moving at peak performance for years. The first engine option is the Vortec 6.0L V8 engine with 360 hp and 380 lb-ft of torque. It also offers Variable Valve Timing (VVT) and is Flex Fuel E85-capable to optimize your fuel output. The second engine is the Duramax 6.6L Turbo-Diesel V8 engine 445 hp and 910 lb-ft. of torque for a larger boost of power than the previous option. This engine is B20-Diesel compatible and offers 3.73 gear ratio, exhaust brake, engine block heater, and capped fuel fill. First impressions are always important when you are judging somethings worth, and the impression the 2018 Chevrolet Silverado 2500HD makes is nothing less than modern, raw, and ready for any adventure you are willing to drive it through. If anyone wants to be your quest support, it’s the Chevrolet Silverado 2500HD. For configuration, you have a mixed assortment of cab and box combinations. The three cabs are regular, double, and crew cab. The regular cab is two regular doors, the double cab is two regular doors and two smaller doors, and the crew cab is four full-sized doors. As for the boxes, you can get either standard or long sized. The standard box is 78.86 inches, and the box long is 97.76 inches. The standard box is not available in the regular cab, only the long box is. Overall, the exterior of the 2018 Chevrolet Silverado 2500HD is clean and modern with a bit of bold flair in order to reflect its perfectly planned engineering and passion for powerful durability. Chevrolet is the type of automotive company that never lets you down when it comes to epic amounts of pure durability. You can always tell that when you buy a Chevrolet truck, you are investing in long-lasting power. Never feel concerned when Chevrolet is providing you the ultimate tools for a perfect ride. Along with dependability, Chevrolet offers vehicles in every class including cars, electric cars, performance vehicles, SUVs, trucks, and commercial vehicles. In short, Chevrolet dealerships are never lacking variety. At Carl Black in Nashville, we are as dependable as the cars we sell. We want all customers to know they can count on us to give the best value for the best vehicle. We can offer this because at the Nashville branch of Carl Black; you can purchase a variety of Chevrolet, GMC, and Buick vehicles as well as a dependable smile and nothing but satisfaction on the mind.